Listen. 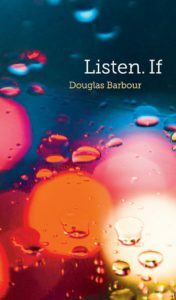 If is Douglas Barbour’s first book of poetry in over a decade and includes work that was produced over a twenty year period. That extended period of production has some interesting effects on the text. Poems like “The Age Demanding” which confronts the Iraq War as very much a crisis of the present lose their urgency. The crisis of the present becomes the crisis of the past, historical and experienced almost as nostalgia. This complicates the work that “The Age Demanding” seems to be doing in passages like “The Republican Party is not a political party./ It’s a mindset, like Hitler Youth” and “you shall know them then/ by the funerals they keep” that identify the Iraq War as a form of institutional violence pursued in the name of ideology. The poem speaks from a particular political moment with a particular language of protest; the violence is immediate and ongoing, in need of immediate action to staunch the bleeding. The strange thing that happens is that time and nostalgia renders that moment almost quaint. That war, named through references to the fallen gates of Babylon and tied to parallel crises and conflicts, has been transformed into a historical moment that the reader experiences indirectly as part of a remembered past. Time, however, has another effect on the poems in Listen. If that speak to a departed historical present. The past becomes an ironic counterpoint to the present, a space where the concerns of the present are revealed not necessarily to be a repetition of the past so much as a series of re-iterations altered by task of memory. Listen. If is a book about memory and remembering. It is reflective and reflexive, a collection marked by meditation. The objects of meditation which include the seasons, love, art, jazz recordings, and memory shift throughout the book, but serve to ground the reader’s experiences in instances and talismans of remembering. In the first serial poem of the book, “Acts of Memory,” Barbour writes: “I remember what I don’t remember. A dream of memory or so it seemed. Seems… in that dream aware that this is the past & I’m in it. That past I’ve only heard of from others. Me then in that memory, lost.” For Barbour, memory is not neat and not necessarily grounded in the self, after all, as he indicates, it is possible to remember things that are beyond one’s own experience or capacity for memory. Part of the play of text derives from that tension between memory and the dream of memory, and the attempt to tell which is which. Perhaps it’s because of that tension that the text is so ekphrastic. The art and artists serving as symbols both aesthetic and historic. They reveal a personal history, the thrill at the sound of a trumpet or the silhouette of the jack pine against the hills and the water, but also—and this is especially pronounced in “Recording Dates”—the history of their composition. The moments of reception and composition produce a dialectic that synthesizes memory. This synthetic moment is interestingly complicated by both the poet’s reflection on the dialectical object and the reader’s position. The way “Recording Dates” engages Jazz interestingly recalls Stephen Scobie’s 2013 collection At the limit of breath where he writes poems about the films Jean-Luc Godard. The crucial difference being that Barbour’s poems may be more firmly rooted in the experience of the reception or the memory of that moment. Listen. If feels familiar. Given that it is a book that plays with and thinks about memory it should be. It is a text marked by the passage of time and moments of reflection. It feels the passage of time as it enacts it. Barbour writes towards the book, “I loved letters from the first for what they/ cannot hide—their own palimpsests they/ exist in multiple layers of time.” Those palimpsests are what make Listen. If worth reading. Dr. Ryan J. Cox has a BA and MA in English Literature and Creative Writing from the University of Windsor. He has also earned a PhD in English Literature from the University of Minnesota. His writing has appeared in Canadian Literature, English Studies in Canada, Arc Poetry Magazine, Carousel, and The Windsor Review.